This explains why he suddenly started making music again – he knew he didn’t have long. I have to say that I only like some of his music, but that’s the point: how can you not like some of it? His musical output is so diverse that I don’t think you can dislike all of it.. Personally, I started with “Ashes to Ashes” and Fashion in the eighties, and then retrospectively found the “Low” and Berlin period stuff to be to my taste. His influence is everywhere, though. I’ve just noticed that the “Music” section is dead in the water..
None of the links actually work.. I’ll sort it out as soon as I can – I’m a bit busy fixing a large qube! renderfarm.. deja vu or what? Posted in News Tagged Music, News 1 Comment on OOOps! I’d just like to take the opportunity to thank everyone who reads my ramblings, whether you read the posts on the site, follow me on twitter or facebook, or subscribe by e-mail..
May next year be all that you want it to be. Sweet manufacturer Chupa Chups are giving away REAL gems hidden in their lollipop wrappers..
Don’t believe me? have a look at the official press release, below..
Milan, April Ist, 2014 – The next time you open up a Chupa Chups lollipop, it could well be an emerald, sapphire or ruby stone worth hundreds of thousands of dollars. Chupa Chups, the world’s most loved lollipop announced today that it has released a series of extremely limited edition, 50-carat precious stone lollipops into its worldwide distribution. The limited edition lollipops – made of entirely of emerald, ruby, sapphire, diamond and giant black pearl – all shaped and priced as an original Chupa Chups – have been distributed randomly across the world as part of a marketing campaign to surprise and delight customers everywhere. 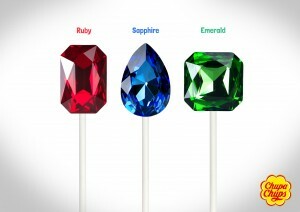 Chupa Chups has released a total of 1 of each of these gemstone lollipops into their worldwide distribution. Chupa Chups Chief Marketing Officer, Marco DiPaulo confirmed that the campaign began a month ago, and has already created overwhelming excitement in Argentina where the first gemstone lollipop has been discovered. “You may ask why Chupa Chups has decided to do this. Well, just imagine if the next person who happens to be lucky enough to uncover a precious gem stone is you,” Mr. DiPaulo said. The campaign is expected to run for as long as until all precious gemstone lollipops are uncovered. Right – I’m off to the local 24hr supermarket. You never know. Breaking News: Boy Finds DIAMOND In A Lollipop Wrapper! Here’s the News Story, from “3 News”..
What do YOU think? Is this for real? A malfunction in the site’s enhanced security system meant that EVERYONE was locked out. Even me!